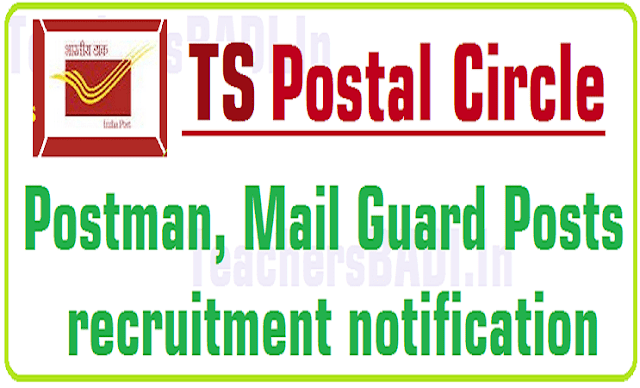 TS Postal Circle Postman, Mail Guard Posts recruitment 2018, Last date to apply: Telangana Postal Circle Postman, Mail Guard Posts recruitment 2018: TS Postal Circle Postman, Mail Guard Posts 2018 recruitment, Online application form, last date for apply, exam date, hall tickets, results details @ http://www.telanganapostalcircle.in/. 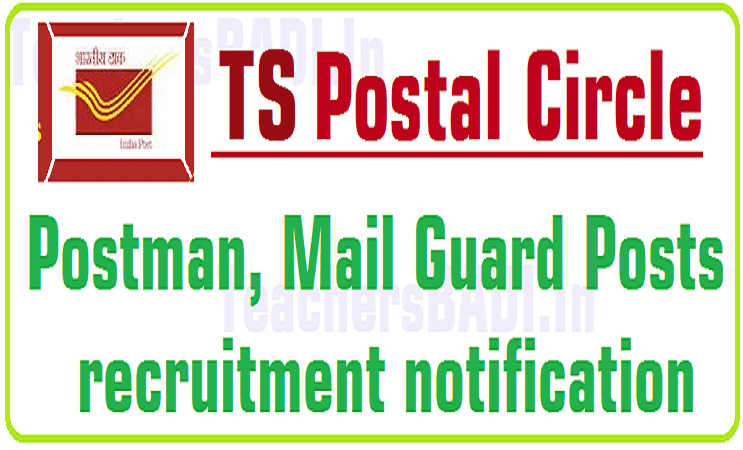 Department of Posts, Office of the Chief Postmaster General , TS Circle , Hyderabad has issued the recruitment notification on March 21, 2018 and the Department of Posts invites applications from the eligible and interested Candidates to fill up the posts of #Postman and #MailGuard in the Postal Divisions/ Units in Telangana Postal Circle. Qualification: Matriculation/ SSC from a recognized Board or University. Age Limit: Candidates age limit should have between from 18 to 27 years. (Upper age limit relaxable for candidates belonging to Scheduled Castes/Scheduled Tribes up to five years and for candidates belonging to Other Backward Classes up to three years & others in accordance with the instructions issued by the Government of India from time to time"). Age relaxation for PH Persons and Ex Servicemen would be as per extant orders of Govt. of India issued from time to time. Scale of Pay: Rs. 5200 - 20200 with Grade Pay of Rs.2000 + admissible allowance. Examination fee: Rs. 400; Candidates belonging to SC/ST/PH/Women are exempted from payment of Examination fee. Selection Procedure: Based on the marks obtained in the Aptitude Test, a merit list of qualified candidates will he prepared in each Postal/ RMS Division separately. The applications are to be submitted online only. Manual applications will not be entertained. The Prescribed Fee (application fee and Examination fee ) has to be paid as per the table at 10 above through "Sunayasam" option in any Head Post Office in Telangana States listed in the Annexure. The Fee is to be credited under "Sunayasam Head:Postman Recruitment 2016." at the Head Post Office with the details Name of the Applicant, Gender, Category, Special Category as per Matriculation/SSC Records & Mobile Number for getting SMS. a) Before applying online the candidate has to keep all the relevant documents ready for entering the data as per the certificates (like DOB Proof, Certificate of caste, Ex Service man ,PH Certificate etc). b) The Candidate has to keep ready of soft copies of his/her recent passport size photograph in JPG format(size not to exceed 20 KB). c) The Candidate has to keep ready a soft copy of his/her signature made on a piece of paper with black ink in JPG format (size not to exceed 10 KB). d) The Candidate has to update all the mandatory fields and confirm the declaration. e) The Candidate has to look at preview for verification and correctness of data fed before submitting his/her application. f) The Candidate has to submit the application by clicking "Save" button. g) Since preview option is provided before saving the application, no correspondence will be entertained for modifying the application. h) The Candidate can take the print out of the application and keep for further correspondence. They should not submit printouts of their application. i) Provision has been made to the candidates to know the status of application submitted through a grievance provision which is available in the website http://www.telanganapostalcircle.in/. TS Post Recruitment Hall Tickets: In this recruitment stream, eligible candidates are going to apply for this recruitment and after completion of application submission process, TS Post circle officials would upload the Hall Permit cards on its official website. So candidates can download their hall tickets from this website. Postman/Mail guard Recruitment Examination to be held on as per schedule. Candidate are requested to please visit the official website. First visit the Andhra Pradesh Post Circle official website by entering the url http://www.telanganapostalcircle.in/. then website will be appeared on your browser.